Due to a spate of recent issues with my Crunch Accounting service I can no longer personally recommend it to anyone who is looking for an online accounting service, although I am still a customer of Crunch at the present time. Changing accountancy software is not simple, especially when you’ve been using a platform for 8 years which is why making the right decision when you startup is so important because if things go wrong later as they have with Crunch moving to a new provider is a long and arduous process. The last year of service from Crunch accounting has been plagued with issues which shouldn’t have happened. Its cost us money in fines and lost time and despite me raising these issues numerous times they’re still making mistakes. I don’t know if we’ve been unlucky or if this is typical of a wider problem at the company but I can’t recommend them until they make these problems right. When I first setup with Crunch in July 2010 there concept was relatively new and unique and although there were other online accountancy tools around I didn’t feel as though they were geared up for UK businesses. I also liked the fact Crunch were a relatively small startup at the time and local to me (based down the road from me at the time in Hove when I was working out of my bedroom at my parents house!). Now there’s plenty of choice around so we’ll be looking into Sage, Quickbooks, Xero and Clearbooks amoung others. Crunch was never perfect as you’ll see from my original Crunch accounting review which I’ve left below for reference but they were at least always responsive. Now it appears they either don’t care or are so overwhelmed that they’re unable to provide the service you’d expect. I may update this page again if/ as/ when anything changes. I’ve been using Crunch Online Accounting for nearly 8 years now. 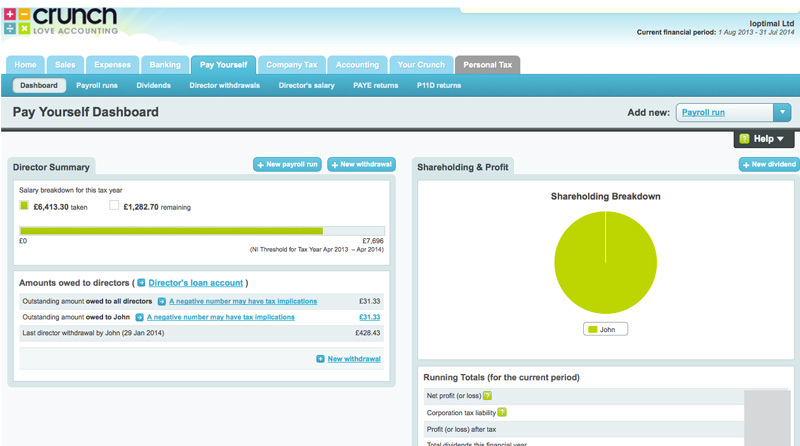 In fact I use them to manage my accounts for 2 different companies, so for the most part my review is a positive one. In this post I’ll outline my own experiences using Crunch Accounting and what I like and don’t like about the system. Bear in mind this is just one users view, and that I know very little about accounting other than what I’ve learned muddling through running my own businesses! Regular readers of my blog (is there any left?!) will know I’ve only ever reviewed a couple of products here, like Raven Tools, which I’ve been a customer of for many years. 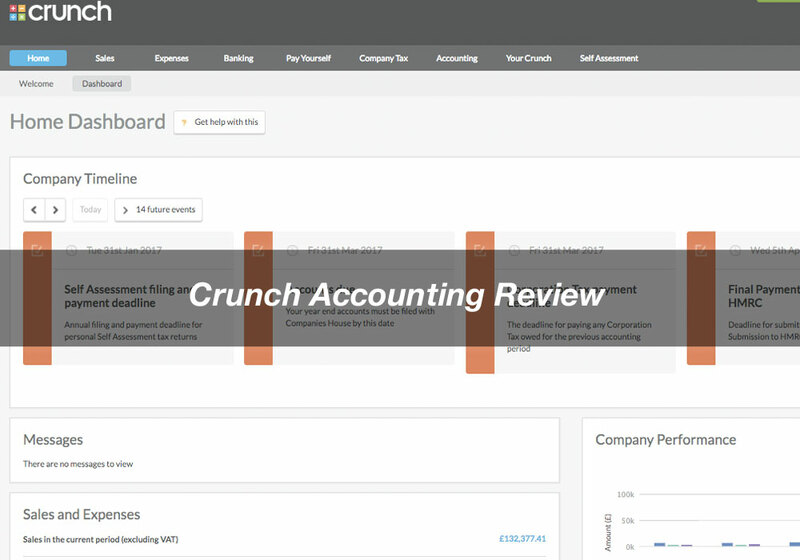 Crunch is the same, I used them as my accountants from when I started freelance consulting in 2010 and we also use them at Inbound360. So this isn’t some sort of shill article to earn some referral fees! Crunch Accounting is an online accounting software package which is sold as a service giving you an account manager and access to accountants. You use their online accounting system to raise and send invoices, record your expenses, pay yourself and log your tax returns. You also get an account manager who you’d contact if you have any questions about your accounts. For most complex requests the account managers will refer to one of the accountants. Crunch will file VAT returns and corporation tax on your behalf and also prepare your annual return. For an additional fee they also complete my personal Self Assessment. Crunch is really designed around freelancers and small businesses who raise invoices (i.e. I don’t think you could use them if you ran a shop for example). You can run payroll for up to 10 members of staff, although realistically if your company is larger than this I think you’re probably better off with a traditional accountant and software like Sage. There’s more about who Crunch is and isn’t for on the website. Obviously this size company are pretty price sensitive (cheap!) so the price of Crunch’s online accounting service needs to reflect that. I pay £65 + VAT/ month for each company I have using Crunch so £780/ year if you’re VAT registered or £936/ year if you’re not registered for VAT or on Flat Rate. By comparison when I was shopping around the cheapest local accountants worked out to around £1,000/ year and most were quite a bit more expensive. Also to be honest I get the view of the accounting profession that there’s a vast spectrum of quality (a bit like SEO 😉 ) so if you’re paying a cheap accountant, there’s probably a reason he’s cheaper than the rest. The little calculator below gives you an estimate of how much Crunch could save you if you switch from a traditional accountant. Invoices & Expenses are where you’re likely to spend most of your time in the Crunch system. The process here will probably be quite familiar to anyone who’s used other accounting software or online invoicing tools like FreshBooks. 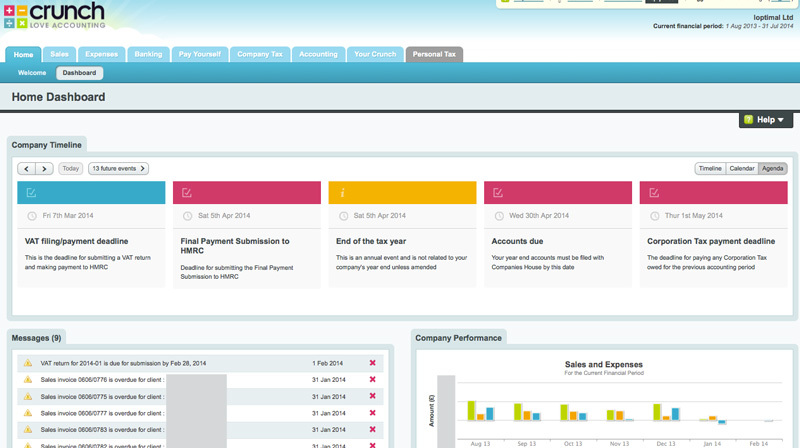 You setup your client profiles in the system then raise invoices against them as you complete work. Once issued you can either have the invoice emailed out automatically from the system or download it and send it yourself < I have one client who I still have to print the PDF invoice out for and send it in the post! Once your client pays you record the payment against that invoice. There’s a bunch of other features I won’t go into details of here like the option to automatically send reminder emails to clients when an invoice becomes overdue. I like this because I find those nagging emails chasing clients for payment painful to write, I’d much rather have the machines do it for me. Expenses work in a similar way, you record details of everything you need to expense in the system. There’s not really a bulk editing feature of any sort here so if you have a lot of expenses that could be a pain, but again in those cases Crunch probably isn’t right for you. There is a recurring expense option for stuff you get billed the same amount for each month. 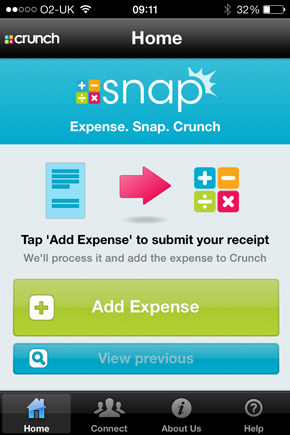 One nice little feature of Crunch is its “Snap app” which is an iphone app which lets you take a photo of your receipts and have them turn up in your Crunch account under the expenses section a few days later. This is really handy if like me you have a load of expenses for things like train tickets and parking and usually forget to record them as expenses. Bank reconciliation is a way of ensuring the payments in and out you’ve recorded in Crunch match up to your bank account, so you don’t forget to record payments in the system. I’m not sure if this is an HMRC requirement or just a Crunch one to be honest but you have to do it before you can submit your annual returns. If you do it regularly its not a problem but if like me you leave it too long, reconciliation is a real pain in the arse! If like me you have loads of little payments going in and out of your accounts you tend to spend a lot of time trying to workout why that 50p came out your account 10 months ago. If you keep your payments and expenses up to date though it shouldn’t be a problem. The reconciliation feature of Crunch works well while its working but if you hit a payment which you can’t identify you can’t skip it and come back to it later so you have to go and track it down before you can move on. Also worth noting, when I first started with Crunch the website would continually run into errors where you’d end up having to logout and log back in again and lose whatever you were working on. Thankfully the worst of those problems are a thing of the past and generally its pretty stable now but when I do still get crashes it tends to be during reconciliation. Crunch Accounting has a built in payroll feature which you can use to pay yourself and your staff salaries and issue payslips. Its nice to have all your payslips and dividends in one place. One thing I’d like to see developed in Crunch is a feature to help with your personal tax. Although Crunch will help with your self assessment for an additional fee, there’s nothing within the system at the moment for helping you manage your personal tax and keep track of your liabilities. What I’d like to be able to see is how much my personal tax liability is and how much money I need to keep stashed for my self-assessment, even if it was only an estimated figure. VAT and Corporation Tax returns have to be the worst part about running a business, however small so I like that Crunch handles these returns with relatively little effort required on my part. They also send reminders when stuff is due to be paid so I don’t have to worry about calendar reminders. Here’s a full list of everything which is included in the Crunch subscription. A problem with the VAT system meant we missed our first VAT return deadline, again leading to a nasty letter from our good friend the tax man. What I think its important to realise with a system like Crunch is that what you’re not paying for is an accountant to pro-actively look at your accounts and check you’re doing the right/ best thing for your business. Although the accountants will prepare your annual returns and flag up issues, I think there’s a limit to what you can expect them to do when paying a relatively small amount for the service. To give an example of this one year I ended up taking a smaller dividend from my company than I could of, meaning I lost out a large amount of my tax free allowance for the year. This is my mistake and it cost me several thousand pounds. Part of me wonders if I was paying a pro-active accountant to look at my books they would have identified something like this and flagged it up. If you’re organised with your own money you probably won’t have any issues like this anyway, its just my own experience or lack there of. My review – do I recommend Crunch Accounting? Ultimately, yes I absolutely do recommend it. In fact I’ve introduced several friends who started up as freelancers to Crunch and they’re getting on well with it. I do think this is the way small business accounting will end up going. Accounting is definitely one industry which technology should be able to simplify and while you’ll always need professional advice, for most small companies with simple books it probably doesn’t make sense to pay an expensive retainer for an accountant to complete menial administrative tasks for you. Whether its right for your business will come down to how complicated your accounts are and how much support you need. If you know what questions to ask and you’re happy to work things out for yourself, there’s no limit to the amount of support Crunch accountants will give you so you know you’ll never end up paying more than the fixed monthly fee. As you can tell from some of the issues I’ve had with my accounts I’m certainly no expert at this stuff but if you keep on top of your accounts I don’t think it has to be that complicated. I hope this reviews helpful for anyone considering using Crunch for their accounting. Feel free to ask me any questions about my experiences with Crunch in the comments or on Twitter. A great contender is SlickPie(www.slickpie.com) accounting software. It’s a free online app for small business and freelancer. The program is simple and easy to use. I am using it to handle my personal and business accounting. It provides a lot of functionality like online invoices, billing, auto payment reminders, auto recurs to regular clients and data entry tool – MagicBot and more.